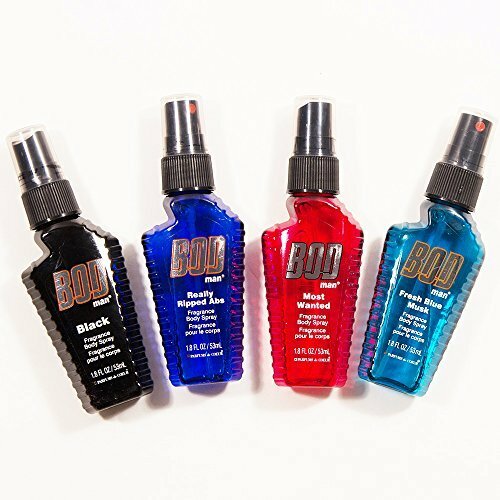 Bod Body Spray for Men -- Set of 4 Popular Bod Man Body Sprays -- Black, Really Ripped Abs, Most Wanted and Fresh Blue Musk. Each Bod Body Spray contains 1.8 Fl Oz (7.2 Oz Total) -- perfect to keep at home or in the gym locker. These Bod body sprays are long lasting and totally irresistible, so what you spray on, stays on. This Bod Body Spray for Men Set is the perfect Father's Day gift. Bod Man cologne fragrances are high quality and clean. Bod Body Spray for Men -- Set of 4 Popular Bod Man Body Sprays -- Black, Really Ripped Abs, Most Wanted and Fresh Blue Musk. Each Bod Body Spray contains 1.8 Fl Oz (7.2 Oz Total) -- perfect to keep at home or in the gym locker. These Bod body sprays are long lasting and totally irresistible, so what you spray on, stays on. This Bod Body Spray for Men Set is the perfect Father's Day gift. Bod Man cologne fragrances are high quality and clean. If you have any questions about this product by Bod Body Spray for Men, contact us by completing and submitting the form below. If you are looking for a specif part number, please include it with your message.